From my blog Deep Blue Home. Deep waves as seen from space. 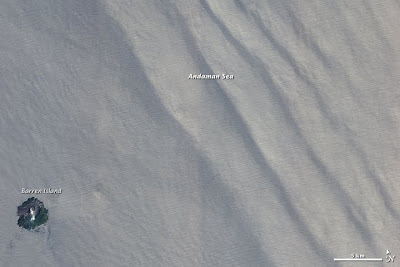 Deep currents as sensed from two miles under Antarctic waters. Both are rewriting what we know of the movement of oceanic waters. Internal waves happen because the ocean is layered. Deep water is cold, dense, and salty, while shallower water is warmer, lighter, and fresher. The differences in density and salinity cause the various layers of the ocean to behave like different fluids. As internal waves move through the lower layer of the ocean, the lighter water above flows down the crests and sinks into the troughs. This motion bunches surface water over the troughs and stretches it over the crests, creating alternating lines of calm water at the crests and rough water at the troughs. It is the pattern of calm and rough water that makes the internal wave visible in satellite images. Calm, smooth waters reflect more light directly back to the satellite, resulting in a bright, pale stripe along the length of the internal wave. The rough waters in the trough scatter light in all directions, forming a dark line. Just as gravity drains the rivers of the land, so gravity drains the rivers of the World Ocean. The saltier, colder, heavier rivers sink beneath the fresher, warmer, lighter ones. The three dimensional realm of the ocean is layered with watersheds running over and atop one another in multiple directions. An exploded view of the global thermohaline circulation looks something like an intricately entwined highway interchange system, with layers crossing and bypassing at many levels, in all directions, and at different speeds. The timescale of the thermohaline circulation is pretty amazing. On the order of a couple of millennia to circulate complete around the world. We currently understand only the broad outline of the system. A new and really important piece of the puzzle was only recently added with this paper in April’s Nature Geoscience (DOI: 10.1038/ngeo842) by researchers from Japan and Tasmania. They found that waters flowing nearly two miles deep in the Southern Ocean are moving at an astonishing 700 meters/2,300 feet a minute (the fastest deep current yet found), with a flow rate of more than 8 million cubic meters/2,800 cubic feet a second. That’s 40 times as much water as the Amazon River. 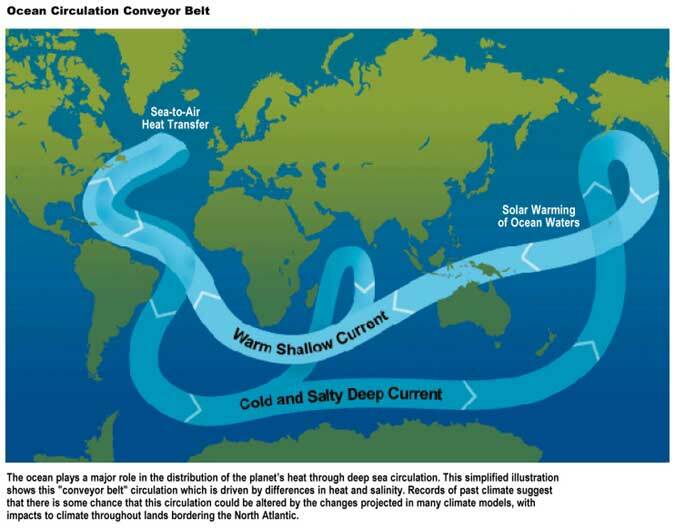 The new current is likely a critical driver of the thermohaline circulation, and global climate.